Source: Received Netgalley in exchange for an honest review. I was intrigued by the cover, and the role of dog rehabilitation in the story. David Cruz is good at two things: war and training dogs. The ex-soldier's toughest case is Atlas, a Belgian Malinois whose handler died in combat. Nobody at Hope's Crossing kennel can break through the animal's grief. That is, until dog whisperer Evelyn Jones walks into the facility . . . and into Atlas's heart. David hates to admit that the curvy blonde's mesmerizing effect isn't limited to canines. But when Lyn's work with Atlas puts her in danger, David will do anything to protect her.Lyn realizes that David's own battle scars make him uniquely qualified for his job as a trainer. Tough as nails yet gentle when it counts, he's gotten closer to Atlas than anyone else-and he's willing to put his hard-wired suspicion aside to let her do the same. But someone desperate enough to kill doesn't want Lyn working with Atlas. Now only teamwork, trust, and courage can save two troubled hearts and the dog who loves them both . . .
Wow. Extreme Honor surprised me. I was expecting it to be good, but I wasn't expecting to find it such an enjoyable read. There were a few elements that felt really fresh and made it fun. Lyn is a woman I easily respected. She worked hard to create a career for herself that was a little unusual, but that played to her strengths and passions, and that allowed her to live her life the way she wanted. I really liked that she put so much thought into how she interacted with people, recognizing that some scenarios and personality types required her to make a strong, constructive first impression or to act in a more dominant or aggressive way than she might normally be inclined. I loved that she was never coy or self-conscious in her desire for and interactions with David. Theirs is a refreshingly mind-game-free romance. Lyn's relationship with her step-father is at once complex and simple. He's something of an Achilles' heel for this otherwise mature woman, neither of them able to find their way to a middle ground for communication and interaction. David, for his part, was also a really relatable character. He's got a personality that borders on Alpha, but without all the obnoxiousness. He's protective of Lyn, overly so at times, but it never felt smothering (perhaps because she never permitted herself to be smothered). What I loved most about their relationship is that they both take the time to consider the other's perspective. Yes. Yes. They also communicate! I'm sure there are other romances out there that have fully communicating leads in it, but... this felt darn near revolutionary for me! I enjoyed the mystery that Lyn and David connect through, but even more than that, I loved the insights into rehabilitating Atlas, the military dog who lost his handler overseas. It's obvious that author is very familiar with the material, and the details were fascinating! 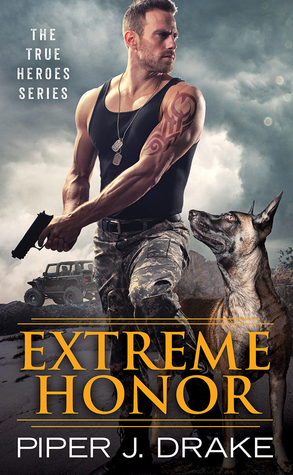 I definitely recommend you pick this one up if you like romantic suspense, military men, or dogs. Extreme Honor exceeded my expectations, and now I wait impatiently for the next book in this series! Don't just take my word for it though! I've gathered up a couple of other blog reviews, so check them out for some other opinions!